Did the SDGs just forget about the state? My research is based on a very simple premise: effective and inclusive states are a necessary component of development. It is not a radical idea, and far from a new one: the co-evolution of states, markets and democracies is the backbone of modern economics, sociology and politics. 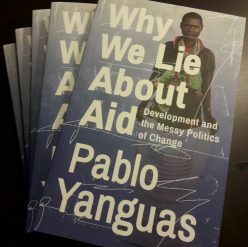 That is why the process of coming up with the Sustainable Development Goals (SDGs) has received some attention from myself and other colleagues: after the politically neutered MDGs, the SDGs held a promise of taking politics seriously for a change. We welcomed the inclusion of Goal 16 in the final list, even if it came with a far too ambitious and convoluted title: “Promote peaceful and inclusive societies for sustainable development, provide access to justice for all and build effective, accountable and inclusive institutions at all levels”. The proof was in the pudding, however, and the Expert Group of the UN Statistical Commission has now released its proposed list of indicators for measuring SDG progress. Sadly, of the 12 targets comprised under Goal 16, only 3 have anything to do with state effectiveness and inclusion, and none of the proposed indicators actually captures the key analytical ingredients of my premise. Continue reading Did the SDGs just forget about the state?